Recent Arrival! $1,167 off MSRP! RAV4 LE 4D Sport Utility 2.5L 4-Cylinder DOHC Dual VVT-i FWD 8-Speed Automatic Magnetic Gray Metallic 6 Speakers, Auto High-beam Headlights, Brake assist, Dual front impact airbags, Emergency communication system: Entune Safety Connect, Exterior Parking Camera Rear, Fabric Seat Trim, Front anti-roll bar, Illuminated entry, Panic alarm, Radio: Entune 3.0 Audio, Remote keyless entry, Speed-sensing steering, Traction control. 26/35 City/Highway MPG Stop by Peoria Toyota today at 7401 N Allen Rd, Peoria, IL 61614 to schedule a test drive or give us a call at 309-693-7000 to make an appointment. To view all available inventory please visit www.peoriatoyota.com. $1,197 off MSRP! RAV4 LE 4D Sport Utility 2.5L 4-Cylinder DOHC Dual VVT-i FWD 8-Speed Automatic Silver Sky Metallic 6 Speakers, All Weather Floor Liners, Auto High-beam Headlights, Brake assist, Cargo Liner, Distance pacing cruise control: Full-Speed Dynamic Radar Cruise Control, Dual front impact airbags, Emergency communication system: Entune Safety Connect, Exterior Parking Camera Rear, Fabric Seat Trim, Front anti-roll bar, Illuminated entry, Panic alarm, Radio: Entune 3.0 Audio, Remote keyless entry, Speed-sensing steering, Traction control. 26/35 City/Highway MPG Stop by Peoria Toyota today at 7401 N Allen Rd, Peoria, IL 61614 to schedule a test drive or give us a call at 309-693-7000 to make an appointment. To view all available inventory please visit www.peoriatoyota.com. $1,297 off MSRP! RAV4 LE 4D Sport Utility 2.5L 4-Cylinder DOHC Dual VVT-i AWD 8-Speed Automatic Midnight Black Metallic 6 Speakers, All Weather Floor Liners, All Weather Liner Package, Auto High-beam Headlights, Brake assist, Cargo Liner, Distance pacing cruise control: Full-Speed Dynamic Radar Cruise Control, Dual front impact airbags, Emergency communication system: Entune Safety Connect, Exterior Parking Camera Rear, Fabric Seat Trim, Front anti-roll bar, Illuminated entry, Panic alarm, Radio: Entune 3.0 Audio, Remote keyless entry, Speed-sensing steering, Traction control. 25/33 City/Highway MPG Stop by Peoria Toyota today at 7401 N Allen Rd, Peoria, IL 61614 to schedule a test drive or give us a call at 309-693-7000 to make an appointment. To view all available inventory please visit www.peoriatoyota.com. Recent Arrival! $1,356 off MSRP! RAV4 LE 4D Sport Utility 2.5L 4-Cylinder DOHC Dual VVT-i AWD 8-Speed Automatic Ruby Flare Pearl 6 Speakers, Auto High-beam Headlights, Brake assist, Dual front impact airbags, Emergency communication system: Entune Safety Connect, Exterior Parking Camera Rear, Fabric Seat Trim, Front anti-roll bar, Illuminated entry, Panic alarm, Radio: Entune 3.0 Audio, Remote keyless entry, Speed-sensing steering, Traction control. 25/33 City/Highway MPG Stop by Peoria Toyota today at 7401 N Allen Rd, Peoria, IL 61614 to schedule a test drive or give us a call at 309-693-7000 to make an appointment. To view all available inventory please visit www.peoriatoyota.com. $1,371 off MSRP! RAV4 LE 4D Sport Utility 2.5L 4-Cylinder DOHC Dual VVT-i AWD 8-Speed Automatic Midnight Black Metallic 6 Speakers, Auto High-beam Headlights, Blind Spot Monitor, Blind Spot Monitor w/Lane Change Assist, Brake assist, Carpet Cargo Mat, Carpet Floor Mats, Carpet Mat Package, Distance pacing cruise control: Full-Speed Dynamic Radar Cruise Control, Dual front impact airbags, Emergency communication system: Entune Safety Connect, Exterior Parking Camera Rear, Fabric Seat Trim, Front anti-roll bar, Illuminated entry, Panic alarm, Radio: Entune 3.0 Audio, Remote keyless entry, Speed-sensing steering, Traction control. 25/33 City/Highway MPG Stop by Peoria Toyota today at 7401 N Allen Rd, Peoria, IL 61614 to schedule a test drive or give us a call at 309-693-7000 to make an appointment. To view all available inventory please visit www.peoriatoyota.com. Recent Arrival! $1,508 off MSRP! RAV4 XLE 4D Sport Utility 2.5L 4-Cylinder DOHC Dual VVT-i FWD 8-Speed Automatic Midnight Black Metallic 5 Door Smart Power locks, 6 Speakers, 8-Way Power-Adjustable Driver's Seat w/Lumbar Support, Automatic temperature control, Blind spot sensor: Blind Spot Monitor w/Rear Cross-Traffic Alert warning, Brake assist, Convenience Package, Distance pacing cruise control: Full-Speed Dynamic Radar Cruise Control, Dual front impact airbags, Emergency communication system: Entune Safety Connect, Exterior Parking Camera Rear, Fabric Seat Trim, Front anti-roll bar, Front dual zone A/C, Front fog lights, Front Seat Heating, Fully automatic headlights, Heated door mirrors, Illuminated entry, Panic alarm, Power moonroof, Radio: Entune 3.0 Audio, Remote keyless entry, Speed-sensing steering, Traction control. 26/35 City/Highway MPG Stop by Peoria Toyota today at 7401 N Allen Rd, Peoria, IL 61614 to schedule a test drive or give us a call at 309-693-7000 to make an appointment. To view all available inventory please visit www.peoriatoyota.com. $1,572 off MSRP! RAV4 XLE 4D Sport Utility 2.5L 4-Cylinder DOHC Dual VVT-i FWD 8-Speed Automatic Silver Sky Metallic 5 Door Smart Power locks, 6 Speakers, 8-Way Power-Adjustable Driver's Seat w/Lumbar Support, All Weather Floor Liners, Blind spot sensor: Blind Spot Monitor w/Rear Cross-Traffic Alert warning, Brake assist, Cargo Liner, Convenience Package, Distance pacing cruise control: Full-Speed Dynamic Radar Cruise Control, Emergency communication system: Entune Safety Connect, Exterior Parking Camera Rear, Fabric Seat Trim, Front dual zone A/C, Front fog lights, Front Seat Heating, Fully automatic headlights, Heated door mirrors, Illuminated entry, Power moonroof, Radio: Entune 3.0 Audio Plus, Remote keyless entry, Speed-sensing steering, Traction control. 26/35 City/Highway MPG Stop by Peoria Toyota today at 7401 N Allen Rd, Peoria, IL 61614 to schedule a test drive or give us a call at 309-693-7000 to make an appointment. To view all available inventory please visit www.peoriatoyota.com. $1,562 off MSRP! RAV4 XLE 4D Sport Utility 2.5L 4-Cylinder DOHC Dual VVT-i AWD 8-Speed Automatic Silver Sky Metallic 5 Door Smart Power locks, 6 Speakers, 8-Way Power-Adjustable Driver's Seat w/Lumbar Support, Automatic temperature control, Blind spot sensor: Blind Spot Monitor w/Rear Cross-Traffic Alert warning, Brake assist, Carpet Cargo Mat, Carpet Floor Mats, Carpet Mat Package, Convenience Package, Distance pacing cruise control: Full-Speed Dynamic Radar Cruise Control, Dual front impact airbags, Emergency communication system: Entune Safety Connect, Exterior Parking Camera Rear, Fabric Seat Trim, Front anti-roll bar, Front dual zone A/C, Front fog lights, Front Seat Heating, Fully automatic headlights, Heated door mirrors, Illuminated entry, Panic alarm, Power moonroof, Radio: Entune 3.0 Audio, Remote keyless entry, Speed-sensing steering, Traction control. 25/33 City/Highway MPG Stop by Peoria Toyota today at 7401 N Allen Rd, Peoria, IL 61614 to schedule a test drive or give us a call at 309-693-7000 to make an appointment. To view all available inventory please visit www.peoriatoyota.com. $1,593 off MSRP! RAV4 XLE 4D Sport Utility 2.5L 4-Cylinder DOHC Dual VVT-i AWD 8-Speed Automatic Blueprint 3 Spoke Leather Heated Steering Wheel, 5 Door Smart Power locks, 6 Speakers, 8-Way Power-Adjustable Driver's Seat w/Lumbar Support, All Weather Floor Liners, All Weather Liner Package, Automatic temperature control, Blind spot sensor: Blind Spot Monitor w/Rear Cross-Traffic Alert warning, Brake assist, Cargo Liner, Cold Weather Package, Convenience Package, Distance pacing cruise control: Full-Speed Dynamic Radar Cruise Control, Dual front impact airbags, Emergency communication system: Entune Safety Connect, Exterior Parking Camera Rear, Fabric Seat Trim, Front anti-roll bar, Front dual zone A/C, Front fog lights, Front Seat Heating, Fully automatic headlights, Heated door mirrors, Illuminated entry, Panic alarm, Power moonroof, Radio: Entune 3.0 Audio, Rain Sensing Front Wipers, Remote keyless entry, Speed-sensing steering, Traction control, Wiper/Windshield Deicer. 25/33 City/Highway MPG Stop by Peoria Toyota today at 7401 N Allen Rd, Peoria, IL 61614 to schedule a test drive or give us a call at 309-693-7000 to make an appointment. To view all available inventory please visit www.peoriatoyota.com. $1,681 off MSRP! RAV4 XLE 4D Sport Utility 2.5L 4-Cylinder DOHC Dual VVT-i AWD 8-Speed Automatic Blueprint 6 Speakers, Automatic temperature control, Blind spot sensor: Blind Spot Monitor w/Rear Cross-Traffic Alert warning, Brake assist, Distance pacing cruise control: Full-Speed Dynamic Radar Cruise Control, Dual front impact airbags, Emergency communication system: Entune Safety Connect, Exterior Parking Camera Rear, Fabric Seat Trim, Front anti-roll bar, Front dual zone A/C, Front fog lights, Fully automatic headlights, Heated door mirrors, Illuminated entry, Panic alarm, Power moonroof, Radio: Entune 3.0 Audio, Remote keyless entry, Speed-sensing steering, Traction control. 25/33 City/Highway MPG Stop by Peoria Toyota today at 7401 N Allen Rd, Peoria, IL 61614 to schedule a test drive or give us a call at 309-693-7000 to make an appointment. To view all available inventory please visit www.peoriatoyota.com. $1,710 off MSRP! RAV4 XLE 4D Sport Utility 2.5L 4-Cylinder DOHC Dual VVT-i AWD 8-Speed Automatic Midnight Black Metallic 5 Door Smart Power locks, 6 Speakers, 8-Way Power-Adjustable Driver's Seat w/Lumbar Support, Automatic temperature control, Blind spot sensor: Blind Spot Monitor w/Rear Cross-Traffic Alert warning, Brake assist, Carpet Cargo Mat, Carpet Floor Mats, Carpet Mat Package, Convenience Package, Dual front impact airbags, Emergency communication system: Entune Safety Connect, Exterior Parking Camera Rear, Fabric Seat Trim, Front anti-roll bar, Front dual zone A/C, Front fog lights, Front Seat Heating, Fully automatic headlights, Heated door mirrors, Illuminated entry, Panic alarm, Power moonroof, Radio: Entune 3.0 Audio, Remote keyless entry, Speed-sensing steering, Traction control. 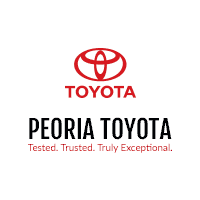 25/33 City/Highway MPG Stop by Peoria Toyota today at 7401 N Allen Rd, Peoria, IL 61614 to schedule a test drive or give us a call at 309-693-7000 to make an appointment. To view all available inventory please visit www.peoriatoyota.com. Recent Arrival! $1,710 off MSRP! RAV4 XLE 4D Sport Utility 2.5L 4-Cylinder DOHC Dual VVT-i AWD 8-Speed Automatic Midnight Black Metallic 5 Door Smart Power locks, 6 Speakers, 8-Way Power-Adjustable Driver's Seat w/Lumbar Support, All Weather Floor Liners, All Weather Liner Package, Automatic temperature control, Blind spot sensor: Blind Spot Monitor w/Rear Cross-Traffic Alert warning, Brake assist, Cargo Liner, Convenience Package, Dual front impact airbags, Emergency communication system: Entune Safety Connect, Exterior Parking Camera Rear, Fabric Seat Trim, Front anti-roll bar, Front dual zone A/C, Front fog lights, Front Seat Heating, Fully automatic headlights, Heated door mirrors, Illuminated entry, Panic alarm, Power moonroof, Radio: Entune 3.0 Audio, Remote keyless entry, Speed-sensing steering, Traction control. 25/33 City/Highway MPG Stop by Peoria Toyota today at 7401 N Allen Rd, Peoria, IL 61614 to schedule a test drive or give us a call at 309-693-7000 to make an appointment. To view all available inventory please visit www.peoriatoyota.com. $1,710 off MSRP! RAV4 XLE 4D Sport Utility 2.5L 4-Cylinder DOHC Dual VVT-i AWD 8-Speed Automatic Lunar Rock 5 Door Smart Power locks, 6 Speakers, 8-Way Power-Adjustable Driver's Seat w/Lumbar Support, All Weather Floor Liners, All Weather Liner Package, Automatic temperature control, Blind spot sensor: Blind Spot Monitor w/Rear Cross-Traffic Alert warning, Brake assist, Cargo Liner, Convenience Package, Distance pacing cruise control: Full-Speed Dynamic Radar Cruise Control, Dual front impact airbags, Emergency communication system: Entune Safety Connect, Exterior Parking Camera Rear, Fabric Seat Trim, Front anti-roll bar, Front dual zone A/C, Front fog lights, Front Seat Heating, Fully automatic headlights, Heated door mirrors, Illuminated entry, Panic alarm, Power moonroof, Radio: Entune 3.0 Audio Plus, Remote keyless entry, Speed-sensing steering, Traction control. 25/33 City/Highway MPG Stop by Peoria Toyota today at 7401 N Allen Rd, Peoria, IL 61614 to schedule a test drive or give us a call at 309-693-7000 to make an appointment. To view all available inventory please visit www.peoriatoyota.com. $1,710 off MSRP! RAV4 XLE 4D Sport Utility 2.5L 4-Cylinder DOHC Dual VVT-i AWD 8-Speed Automatic Midnight Black Metallic 5 Door Smart Power locks, 6 Speakers, 8-Way Power-Adjustable Driver's Seat w/Lumbar Support, All Weather Floor Liners, All Weather Liner Package, Automatic temperature control, Blind spot sensor: Blind Spot Monitor w/Rear Cross-Traffic Alert warning, Brake assist, Cargo Liner, Convenience Package, Distance pacing cruise control: Full-Speed Dynamic Radar Cruise Control, Dual front impact airbags, Emergency communication system: Entune Safety Connect, Exterior Parking Camera Rear, Fabric Seat Trim, Front anti-roll bar, Front dual zone A/C, Front fog lights, Front Seat Heating, Fully automatic headlights, Heated door mirrors, Illuminated entry, Panic alarm, Power moonroof, Radio: Entune 3.0 Audio, Remote keyless entry, Speed-sensing steering, Traction control. 25/33 City/Highway MPG Stop by Peoria Toyota today at 7401 N Allen Rd, Peoria, IL 61614 to schedule a test drive or give us a call at 309-693-7000 to make an appointment. To view all available inventory please visit www.peoriatoyota.com. $1,666 off MSRP! RAV4 XLE 4D Sport Utility 2.5L 4-Cylinder DOHC Dual VVT-i AWD 8-Speed Automatic Ruby Flare Pearl 6 Speakers, Automatic temperature control, Blind spot sensor: Blind Spot Monitor w/Rear Cross-Traffic Alert warning, Brake assist, Dual front impact airbags, Emergency communication system: Entune Safety Connect, Exterior Parking Camera Rear, Fabric Seat Trim, Front anti-roll bar, Front dual zone A/C, Front fog lights, Fully automatic headlights, Heated door mirrors, Illuminated entry, Panic alarm, Power moonroof, Radio: Entune 3.0 Audio, Remote keyless entry, Speed-sensing steering, Traction control. 25/33 City/Highway MPG Stop by Peoria Toyota today at 7401 N Allen Rd, Peoria, IL 61614 to schedule a test drive or give us a call at 309-693-7000 to make an appointment. To view all available inventory please visit www.peoriatoyota.com. Recent Arrival! $1,423 off MSRP! RAV4 XLE 4D Sport Utility 2.5L 4-Cylinder DOHC Dual VVT-i AWD 8-Speed Automatic Super White 6 Speakers, Automatic temperature control, Blind spot sensor: Blind Spot Monitor w/Rear Cross-Traffic Alert warning, Brake assist, Distance pacing cruise control: Full-Speed Dynamic Radar Cruise Control, Dual front impact airbags, Emergency communication system: Entune Safety Connect, Exterior Parking Camera Rear, Fabric Seat Trim, Front anti-roll bar, Front dual zone A/C, Front fog lights, Fully automatic headlights, Heated door mirrors, Illuminated entry, Panic alarm, Power moonroof, Radio: Entune 3.0 Audio, Remote keyless entry, Speed-sensing steering, Traction control. 25/33 City/Highway MPG Stop by Peoria Toyota today at 7401 N Allen Rd, Peoria, IL 61614 to schedule a test drive or give us a call at 309-693-7000 to make an appointment. To view all available inventory please visit www.peoriatoyota.com. $1,764 off MSRP! RAV4 XLE 4D Sport Utility 2.5L 4-Cylinder DOHC Dual VVT-i AWD 8-Speed Automatic Midnight Black Metallic 3 Spoke Leather Heated Steering Wheel, 5 Door Smart Power locks, 6 Speakers, 8-Way Power-Adjustable Driver's Seat w/Lumbar Support, Automatic temperature control, Blind spot sensor: Blind Spot Monitor w/Rear Cross-Traffic Alert warning, Brake assist, Carpet Cargo Mat, Carpet Floor Mats, Carpet Mat Package, Cold Weather Package, Convenience Package, Distance pacing cruise control: Full-Speed Dynamic Radar Cruise Control, Dual front impact airbags, Emergency communication system: Entune Safety Connect, Exterior Parking Camera Rear, Fabric Seat Trim, Front anti-roll bar, Front dual zone A/C, Front fog lights, Front Seat Heating, Fully automatic headlights, Heated door mirrors, Illuminated entry, Panic alarm, Power moonroof, Radio: Entune 3.0 Audio, Rain Sensing Front Wipers, Remote keyless entry, Speed-sensing steering, Traction control, Wiper/Windshield Deicer. 25/33 City/Highway MPG Stop by Peoria Toyota today at 7401 N Allen Rd, Peoria, IL 61614 to schedule a test drive or give us a call at 309-693-7000 to make an appointment. To view all available inventory please visit www.peoriatoyota.com. $1,691 off MSRP! RAV4 XLE Premium 4D Sport Utility 2.5L 4-Cylinder DOHC Dual VVT-i AWD 8-Speed Automatic Magnetic Gray Metallic 3 Spoke Leather Heated Steering Wheel, 5 Door Smart Power locks, 6 Speakers, 8-Way Power-Adjustable Driver's Seat w/Lumbar Support, Automatic temperature control, Blind spot sensor: Blind Spot Monitor w/Rear Cross-Traffic Alert warning, Brake assist, Carpet Cargo Mat, Carpet Floor Mats, Carpet Mat Package, Cold Weather Package, Driver Seat w/2-Position Memory Function, Dual front impact airbags, Emergency communication system: Entune Safety Connect, Exterior Parking Camera Rear, Front anti-roll bar, Front dual zone A/C, Front fog lights, Front Seat Heating, Fully automatic headlights, Heated door mirrors, Illuminated entry, Panic alarm, Power moonroof, Radio: Entune 3.0 Audio, Rain Sensing Front Wipers, Remote keyless entry, SofTex Seat Trim, Speed-sensing steering, Traction control, Wiper/Windshield Deicer, XLE Premium Package. 25/33 City/Highway MPG Stop by Peoria Toyota today at 7401 N Allen Rd, Peoria, IL 61614 to schedule a test drive or give us a call at 309-693-7000 to make an appointment. To view all available inventory please visit www.peoriatoyota.com.